This case study presents a female aged 54 yrs with a 12 months history of progressive pulmonary impairment after a 7-yr period of occupational exposure to rotary-cut polyethylene. An open lung biopsy revealed the histopathology of follicular bronchiolitis that is viewed as a stereotypical feature for flock worker's lung. It seems to be the first case of plastic flock-associated interstitial lung disease reported outside North America. A 54-yr-old female, textile worker was admitted to hospital in March 1998 for haemoptysis. She presented with an 11–12 month history of worsening dyspnoea on effort, dry cough and the more recent onset of low-grade fever, weight loss, and chest pain on deep inspiration. At the time, she had been working 5 days a week >8 h per day, for 7 yrs, in the recycling department of a small industrial polyethylene fibre plant in Orihuela, Alicante, Spain. The polyethylene tows were cut by a rotary device which generated fibres of a small size (flock) and this flock, mixed with polyethylene grain was used to produce new plastic tows for fishing nets. As a job the patient introduced the remnants from the sheared tows, into the grinder as well as controlling the appropriate functioning of the device and checking the product prior to it being mixed with new plastic grains. 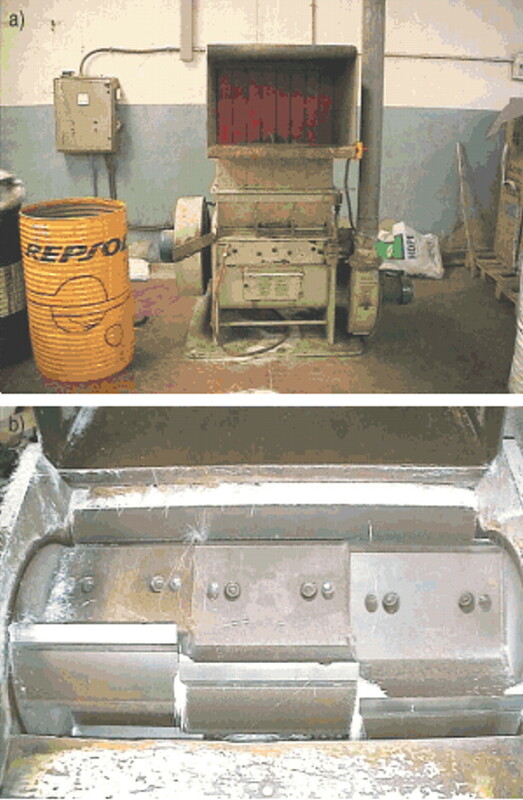 The unique rotary cutting machine (grinder) used in this plant from 1990–present day is shown in figure 1⇓. a) A photograph of the rotary cutter machine (grinder) used by the patient, Eurotecno, Barcelona (Spain). b) Detail of the rotary cutter blades. The grinder was sited in a separate room, ventilated by two windows, one of which was connected with the main area of the plant. The machine was made and distributed by Eurotecno, Barcelona (Spain). The patient reported having high exposure to loose flock and dust associated with recycled Polyethylene. The patient had never smoked and denied a history of atopic illness. Physical examination revealed her to be a well-nourished female who was febrile (38°C), with a change to cardiac frequency of 103 beats·min−1, a respiratory frequency of 36 breaths·min−1 and a blood pressure of 120/80 mmHg. Chest auscultation revealed bilateral inspiratory crackles. Leukocytes were 25.7×109·L−1 with a 0.83 fraction of 1.00 polymorphonuclear forms; erythrocytes were 5.3×1012·L−1; with a haemoglobin of 129 g·L−1 and erythrocyte sedimentation rate of 70 mm·h−1. Rheumatoid factor and antinuclear antibody were negative. A chest radiograph showed a peripheral discrete nodular pattern in the right lung. A chest computed tomography (CT) scan revealed small acinar nodules on the right lung. Pulmonary function testing revealed a severe restrictive functional defect (table 1⇓). An arterial blood gas on room air revealed a pH of 7.44, carbon dioxide tension in arterial blood of 5.3 kPa and an oxygen tension in arterial blood of 9.3 kPa. A fiberbronchoscopy was normal without evidence of active blooding. She was discharged and her symptoms improved over the next 7 days following treatment with antibiotics, inhaled β-agonists and supplemental oxygen. In spite of treatment with inhaled steroids and β-agonist, she was readmitted to the hospital twice in the next 15 months because of accentuation of the symptoms. At the last admission, a functional study showed a forced vital capacity (FVC) of 1.31 L (53% of predicted), forced expiratory volume in one second 41% pred and total lung capacity 2.98 L (69% pred), and a bilateral peripheral nodular infiltrate was evident on a new chest CT. An open lung biopsy performed after a nonspecific transbronchial biopsy revealed a follicular bronchiolitis with peribronchiolar prominent reactive lymphoid follicles that compressed bronchiolar lumina (fig. 2⇓). 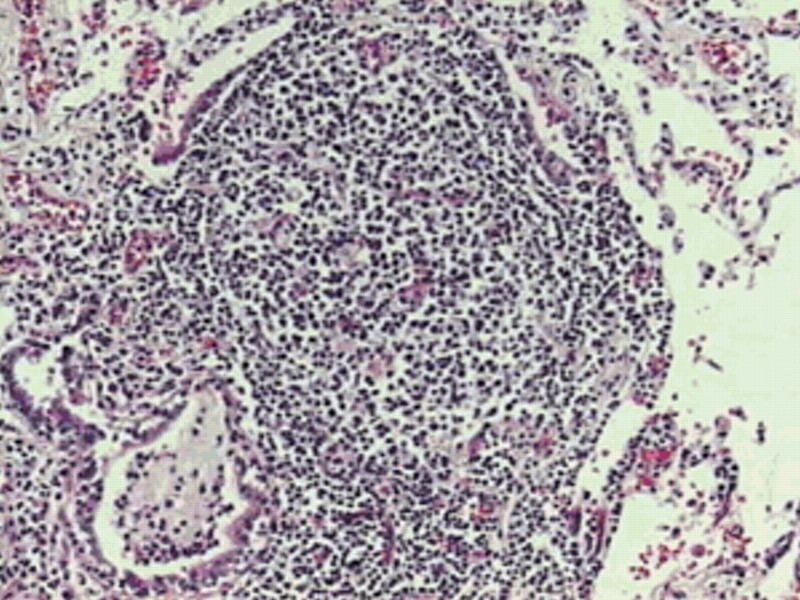 Lymphoid infiltrate limited to the peribronchiolar lymphoid follicle (stain: haematoxylin). Prednisone 1 mg·kg−1·day−1 was administered for 4 months without apparent functional improvement. One year after hospital discharge, the patient remained on inhaled steroids and β-agonists and required short courses of corticosteroid for exacerbation of respiratory problems. Currently she reports feeling better but spirometry and lung volumes show a further decline of FVC due to air trapping (table 1⇑). Since the first hospital admission, she has permanently left the workplace. Flock is pulverised or cut fibre (synthetic or natural) of small diameter (that produces a velvet-like coating when applied to adhesive-coated fabric or other material). Synthetic materials that produce flock include nylon, rayon and polyester. Since January 2000, a particular interstitial lung disease (ILD), termed flock worker's lung, has been reported in a total of 24 workers exposed to nylon flock and flock processing for upholstery, by a rarely used cutting technology, at five different plants in three different USA states and in Canada 1–3. Patients presented a cough and shortness of breath occurring months or sometimes years before clinical presentation, which in somes instances seemed precipitated by an acute exacerbation in the preceding few days. Weight loss and arthralgias were noted in some of them. Most of the patients who had a biopsy had lymphocytic bronchiolitis. In general, recovery occurred over a period of months or years after steroid treatment and leaving the place of work, with some having persistent dyspnoea, exercise limitation, or requirements for chronic supplemental oxygen. The absence of similar cases reported outside North America could be the consequence of the rare use of rotary-cut nylon flock; however, because patients did not report a work-related pattern of symptoms, because improvement required weeks to months of removal from the workplace, the disorder may have been erroneously attributed to an idiopathic origin. For Kern et al. 3, three findings are sufficient for a diagnosis of flock worker's lung: 1) persistent respiratory symptoms; 2) previous work in the flocking industry; and 3) histological evidence of ILD that has no better explanation. In contrast, the National Institute Occupational Safety and Health (NIOSH) required for diagnosis the presence of a pathological lesion with a characteristic pattern: lymphocytic bronchiolitis and peribronchiolitis with lymphoid hyperplasia represented by the presence of lymphoid aggregates 4, 5. This report presents a female with a history of occupational exposure to rotary-cut polyethylene (a pulverised synthetic fibre), who presented symptoms and a clinical course compatible with those previously reported with this ILD, along with the histopathology that is viewed as stereotypical for flock worker's lung. It seems to be the first case of this disorder reported in Europe. A condition probably under-recognised therefore, not adequately prevented. Between January–February 2002, all 15 patients currently working at the plant have been reviewed at the authors' hospital. This control included a conventional and occupational history, physical examination, routine chest radiography, chest high-resolution computed tomography scan, and a complete respiratory functional evaluation. A 60-yr-old smoker of 45-packs per yr presented first morning productive cough and a forced expiratory volume in one second/forced vital capacity of 68%. Another 26-yr-old worker who was a nonsmoker reported dry cough after effort. Forced vital capacity was 80% predicted and total lung capacity 71% predicted. An exercise test neither provoked a cough or led to a significant decrease in pulmonary volumes or forced flows. In both workers chest high-resolution computed tomography scans were considered normal. Both employees had worked at the grinding. The remaining 13 patients referred no symptoms and neither the roentgenologic studies nor respiratory functional assessment disclosed any abnormality. Lougheed MD, Roos JO, Waddell WR, Munt PW. Desquamative interstitial pneumonitis and diffuse alveolar damage in textile workers. Chest 1995;108:1196–1200. Kern DG, Crausman RS, Durand KTH, Nayer A, Kuhn III C. Flock worker's lung: Chronic interstitial lung disease in the nylon flocking industry. Ann Intern Med 1998;129:261–272. Kern DG, Kuhn III C, Ely EW, et al. Flock worker's lung. Broadening the spectrum of clinicopathology, narrowing the spectrum of suspected etiologies. Chest 2000;117:251–259. Eschenbacher WL, Kreiss K, Lougheed MD, Pransky GS, Day B, Castellan RM. Nylon flock-associate interstitial lung disease. Am J Respir Crit Care Med 1999;159:2003–2008. Boag AH, Colby TV, Fraire AE, et al. The pathology of interstitial lung disease in nylon flock workers. Am J Surg Pathol 1999;23:1539–1545.